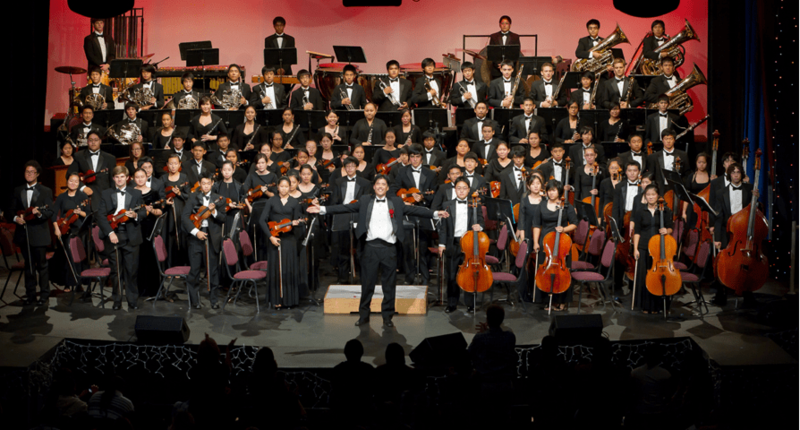 Moanalua High School students in the award-winning orchestra have proudly raised $200,000 over the last 6 years through their annual holiday concert. These students, who have performed at Carnegie Hall in New York three times, don’t keep the money to buy new instruments, travel abroad or help their school. Instead, they send $30,000 they raise every year overseas to a well-known charity, Mercy Ships, which is current housing American doctors in Africa on a medical mission. These doctors help the poorest of residents – some who have never seen a doctor – with urgent medical and dental needs. It is the students’ gift to the world during the holidays and their chance to make difference for others in need. The seventh annual fundraiser was set for this weekend, and students have been practicing for months to ensure their performance was perfect. But an atheist activist, who has shown up to protest city hall Christmas tree lighting ceremonies as well as city council hearings and legislative events where there is prayer, has turned up as their Christmas Grinch and put a stop to the kids’ best-laid plans just hours before the show. Mitch Kahle, founder of Hawaii Residents for Separation of Church and State, wrote a letter to the Department of Education on “Freedom from Religion Foundation” stationary on December 3 demanding state officials stop the concert. He claimed the public high school was in cahoots with New Hope, one of Hawaii’s largest Christian churches. It’s true that some of the New Hope parishioners volunteered to sell tickets or work on the set. But the concert is run by school staff and features its students, and tickets are sold both on campus and by phone. One hundred percent of the proceeds go to Mercy Ships. Historically, Mercy Ships, which has been the beneficiary of the concert for 4 years, used the $30,000 from Moanalua’s concert to get another $30,000 from matching donors. “People are assuming this is a New Hope event when it is not. They cancelled a high school event,” said Chad Brownstein, a volunteer with the concert, graduate of the school and employee of New Hope. Michael W. Perry, Hawaii’s best-known radio talk show host, has been covering the controversy extensively on his morning show on KSSK, a Clear Channel station. “It is an unfortunate situation in which one person writing one letter to the DOE has disrupted a $30,000 fundraiser going on for 6 years now, and for what reason? He claims the Constitution says there can be no involvement with school and church and there is no such statement in the Constitution,” Perry said. Donalyn Dela Cruz, director of Communications for the DOE, said the decision announced Monday to cancel the Friday concert was made by the DOE after consultation with the Attorney General’s office. “The Department applauds both the students who were hoping to provide this concert, as well as the charitable purpose behind it. However, after some consideration, the Department realized that the concert could have been better structured,” Dela Cruz said. Kahle is Hawaii’s only well known atheist who makes God an issue. He’s protested the police department using the words “so help me God” in their oath of office, and got the Honolulu Police Department to remove the words from the oath in September 2002. Kahle appears to enjoy the media attention, because he has his media mentions posted prominently throughout his web site dating back for several years including the most exposure he’s had in an interview with Bill O’Reilly on Fox’s O’Reilly Factor. But besides threatening letters that on occasion are backed by the ACLU, and the tantrums he’s thrown at city hall and the legislature when God is mentioned, Kahle has had few actual legal successes. His group is made up of a handful of atheists who want God banished from the planet. One of his main sidekicks is his wife Holly Huber. Kahle doesn’t win in court so much as he gets his way by getting people in government to simply bend to his wishes through bullying and threats. He has intimidated Senate leadership into cancelling its daily prayer during the 60-working day session. He’s pushed the Honolulu City Council leadership into cancelling only prayer a month typically held before its monthly meeting. He’s harassed the military until it took a cross down from its property. And when loved ones lost their family members on Mothers’ Day, May 9, 1999, during a tragic land slide at Sacred Falls park, and they posted eight small crosses by the roadside in remembrance, Kahle insisted the state remove them from the public sidewalk. Kahle also takes credit for getting Boy Scouts programs and oath restricted on public school campuses in 2002, getting the phrase “I believe in God” removed from Navy youth cards, as well as getting “God Bless America “removed from the tax department and health department facilities shortly after the 9-11-2001 terrorist attack on America. “I guess it is not a career enhancing move to have your government agency sued, because you stood up to this guy, but someone needs to,” said KSSK’s Perry. Perry, who emcees the City Hall Christmas Tree lighting celebration, experienced Kahle’s protests firsthand when Kahle, in front of thousands of children, tried to shout down the Buddhist and Christian religious leaders offering prayers ahead of the tree lighting. When Perry took the stage, he told the children that “someone probably wouldn’t be getting a visit from Santa Claus”, and their laughter drowned out his Kahle’s protests. There have been government officials who have stood up to Kahle. House Speaker Calvin Say, a Democrat who represents Palolo, refused to ban prayer in the House of Representatives’ daily sessions even after Senate’s Democrat leadership capitulated. Despite the ban on prayer in the Senate, Senate Minority Leader Sam Slom also rebuts Kahle’s demands by mentioning God every day in his closing remarks. Kahle is often there with his wife filming Slom. While the student concert will not go on, New Hope will try to make up for the $30,000 that was promised Mercy Ships, by holding its own concert on Friday, December 7. The event will take place at 290 Sand Island Access Road at 7:30 p.m. Ticket holders to The Gift of Hope Charity Concert may use those tickets to attend the New Hope concert. Refunds from the Moanalua Winter program are also available Friday night at New Hope’s weekend services or at Moanalua High School. Brownstein said all refunds unclaimed after December 21st will be donated to Mercy Ships. have americans become so stupid that they cant even identify when their culture is being destroyed by one lone idiot? or are they just so spineless that they can't stand up against it? And y'all want to export this kind of "democracy" to the rest of the world and still don't get why we, the rest of the world don't want it? Unfortunately, it appears that a very selfish and self absorbed little man missed the point. The child that he is, is unable to see the greater good being done by these young people and their choice to give wholeheartedly to a wonderful charity. The sadder part is the DOE's cowardice, also incapable of any backbone whatsoever. For heavens sake, one little man goes "boo" and they run scared? These parents are taxpayers, they have vocal cords and votes…stand up to this nonsense. This issue, besides being half a year old, is clear-cut. Public schools can't put on performances to raise money for a Christian outreach ministry. The DOE isn't being cowardly, they're obeying the law and the constitution. If the school administrators had selected a neutral charity like Doctors Without Borders in the first place, none of this would have happened. Blame them for selecting a sectarian organization. I find it funny that America was a country built on religion. And yet, as I look through these comments, the pro-christian ones are getting more dislikes than the pro-atheist ones. A sign of the changing times. A sign of the war on religion. First, I find it funny that a lot of people, like yourself, think America “was built on religion” when in fact it was built on the freedom of religion. Believe it or not there is a gigantic difference there. In fact your statements go directly against what our founding fathers fought for. The first amendment reads “Congress shall make no law respecting an establishment of religion, or prohibiting the free exercise thereof; or abridging the freedom of speech, or of the press; or the right of the people peaceably to assemble, and to petition the government for a redress of grievances.” It doesn’t read ” Congress shall make laws respecting only the establishment of the Christian religion, and prohibits the free exercise of any other religion or lack thereof.” The man who stopped this practice of religion in our schools, regardless of the cause behind it , was 100% right and simply enforcing the laws of the United States that have been in place since the establishment of our country. Lastly, there is no ” war on religion” the truth is Christians feel that the beliefs they hold trump all others, so when their beliefs cross US law and are fought against they get upset. The true war here is the war against discrimination of any non Christians and the war against Christian beliefs tainting our country’s foundation. This is a secular country founded on the ideology of secularism in the government and the freedom to practice whatever religion you want . "GLAAD issued the following statement in response to A&E's decision, : "What’s clear is that such hateful anti-gay comments are unacceptable to fans, viewers, and networks alike. By taking quick action and removing Robertson from future filming, A&E has sent a strong message that discrimination is neither a Christian nor an American value." kjmatamoros forgets how LGBT's started this controversy by reacting to THE Democrat Bill Clinton (Hillary's husband) when he signed DOMA in 96, & brought federal involvement into "marriages"
And B.Obama only stated he will not defend it, but it still lives.